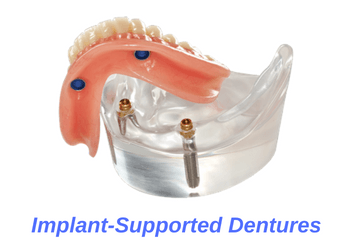 What are implant supported dentures (overdentures)? What are the different types of implant supported dentures? Implant supported denture treatment in Orange County. By adding just a few dental implants, you can lock your dentures securely in place and improve their fit. Implant supported dentures, or overdentures, are dentures which anchor onto a few dental implants. Regular dentures can be loose, causing denture wearers pain, discomfort and sore lesions. By adding just a few dental implants, you can lock your dentures securely in place and improve their fit. The addition of a few dental implants makes your false teeth much more stable and improves chewing capability. Plus, implant supported dentures are designed to be smaller than traditional dentures, which further improves your comfort level. Implant supported dentures offer an affordable solution to improve your denture fit. An obvious advantage of adding dental implants to support your dentures is the added security and stability. This means that you get to eat and talk better and with more confidence. Plus, you no longer have to worry about your teeth flying out by accident. Dental implants will act as anchors to hold your false teeth in place to keep them from moving and rocking as much. Overdentures are more stable than traditional dentures, which means they won’t rock as much during chewing. Dental implants will act as anchors to hold your false teeth in place to keep them from moving and rocking as much. This means you can chew better and eat more comfortably. Wearing dentures can be a constant struggle to some people. Dentures require routine maintenance and frequent remakes. Additionally, they can break, become loose, lose their teeth, wear flat, etc. Adding a few dental implants to support your dentures doesn’t resolve all these issues. However, overdentures are much more pleasant to wear as compared to traditional dentures. Overdentures are more stable, which causes less gum irritation and leads to fewer sore spots in your mouth. And with implant supported dentures, you won’t have to use all that irritating denture cream any longer! Finally, implant supported dentures help protect your valuable jaw bone. Losing al of your teeth and wearing dentures will cause your jaw bone to shrink rapidly over the years. Adding just a few dental implants to support your dentures will reduce the pressure exerted onto your jaw bone. This helps preserve your facial bone structure as you get older. Additionally, you will maintain better facial muscle appearance which makes you feel younger and healthier. You need a minimum of 2 dental implants to support overdentures. 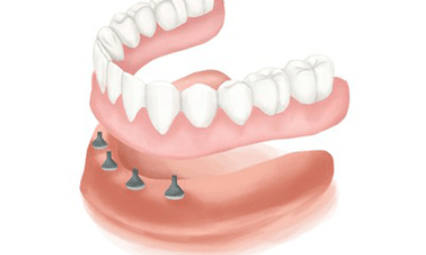 Four implants provide for even more support and secure your dentures in place. 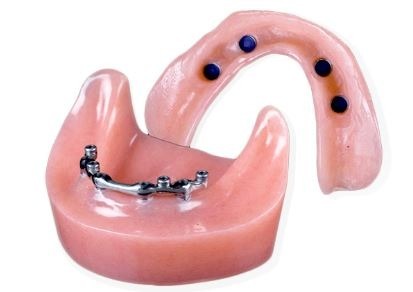 A denture bar provides for maximum stability of overdentures. As mentioned above, the minimum number of dental implants required to make implant supported dentures is two implants. These two implants will be distributed on the right side and left side to provide for bilateral support and stability. 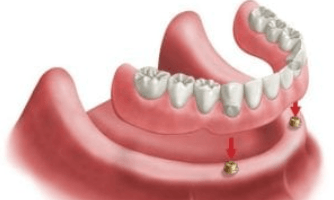 This is a good treatment option if you have no teeth left on either the top or bottom and simply want your teeth to be a little more stable. Overdentures supported by two implants typically require annual visits to the dentist to replace the connectors as they become loose over time. With 4 dental implants, you get double the support. 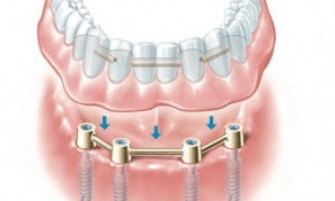 This is a better long-term option because should one implant or connector get loose, there are 3 more implants that are locking the denture in place. This means better long term stability and less frequent adjustment appointments. Of course, adding two extra implants will add to your costs, so you need to be sure that this is a good treatment option for your specific needs. Implant retained bar provides maximum stability among all overdenture treatment options. Adding an implant supported denture bar will significant improve the stability of your denture. With a denture bar, you require 4 to 6 implants to fabricate a metal bar on top. This bar is very large so it provides the highest level of stability among all removable denture treatment options. Implant retained bar provides maximum stability among all overdenture treatment options. However, adding implants and a denture bar can be very expensive. In fact, the cost of implant supported bar typically approaches that of all-on-four teeth. 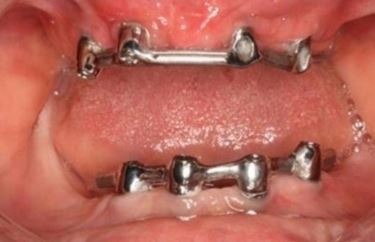 It might be a bad idea to consider all-on-four dental implants as an alternative to a denture bar whenever applicable. Each treatment option offers a varying degree of support and stability. Of course, cost of treatment correlates with the number of implants which you will receive. So which is the best treatment option for you? It all depends on your jaw size, arch shape, bone quality, bite forces, diet, opposing teeth structure and many other factors. Talk to your dentist to determine which is the best treatment option for your specific needs. Stop struggling with ill-fitting dentures and come in today for your free consultation.